A few posts ago Jerry from the Quiet Solo Pursuits blog and I were talking about how much there is to see on the bark of trees. Almost like an entire world in one square foot of tree bark, we agreed. 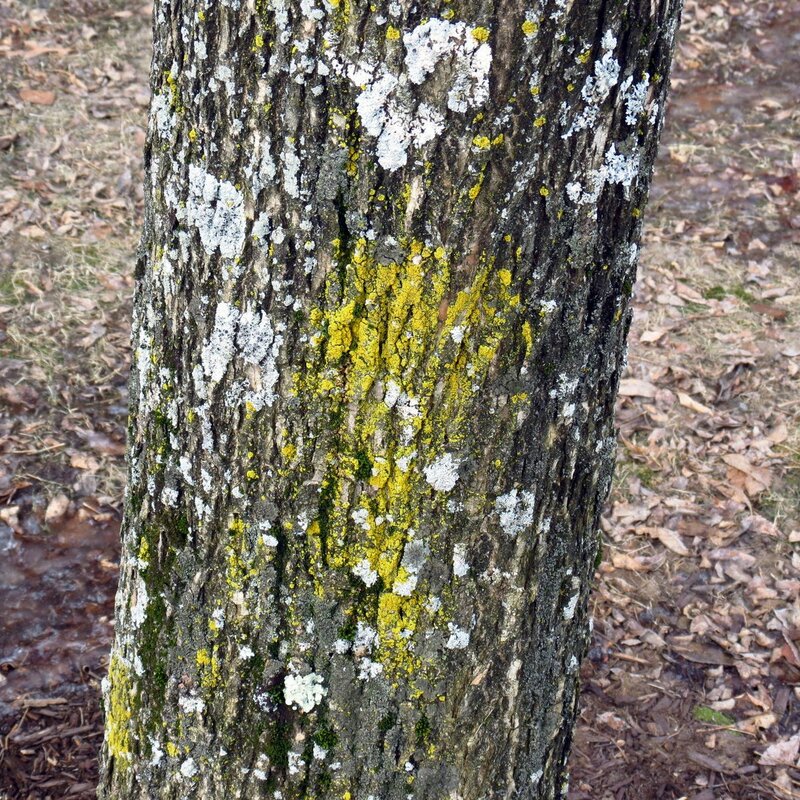 Of course that got me thinking that it might be interesting to see what I could actually find on a square foot of tree bark, and the above photo is of the tree I chose. It’s nothing special; just a tree in a local shopping mall, but I’ve had trouble figuring out what it is. Landscape architects have hundreds if not thousands of trees to choose from these days, so it could be from virtually any place on earth. Its bark and shape look a lot like hop hornbeam, but I don’t think that’s what it is. 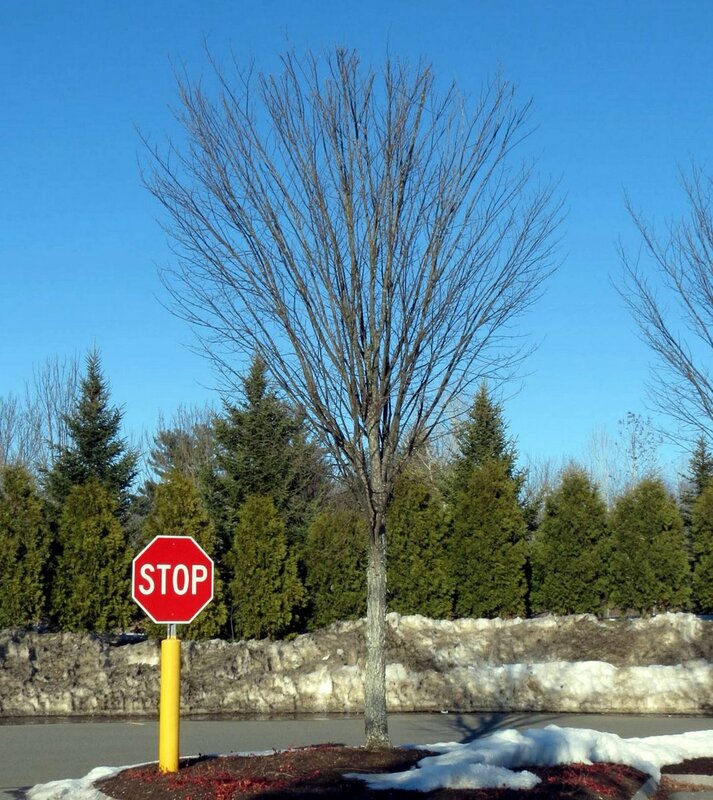 Anyhow, this post isn’t about the tree. 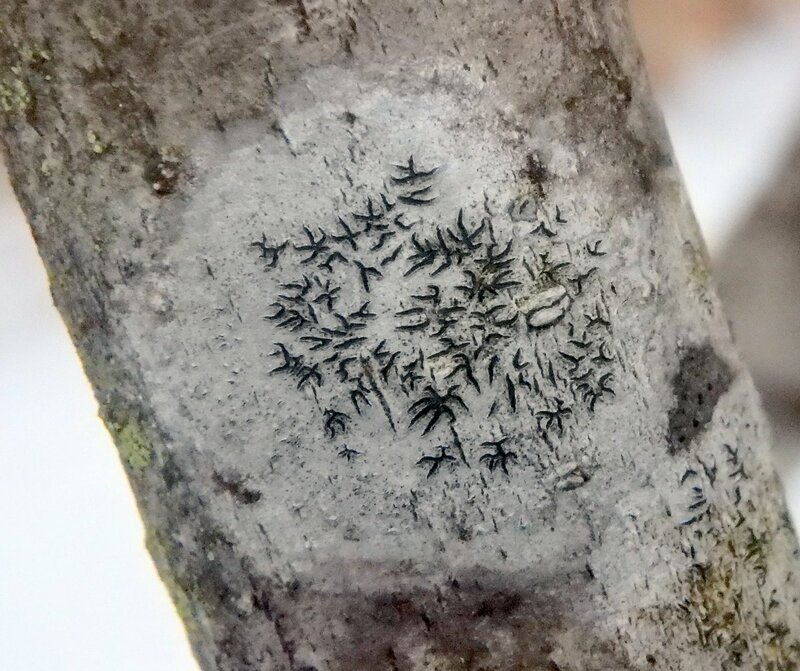 This post is about the gardens that grow on trees, and this particular specimen had so much growing on it that you could hardly see its bark in places. To give you some idea of the scale of what we’re looking at, that little tuft of moss in the center of the photo is roughly the same diameter as a quarter, or slightly less than an inch (24.26 mm). 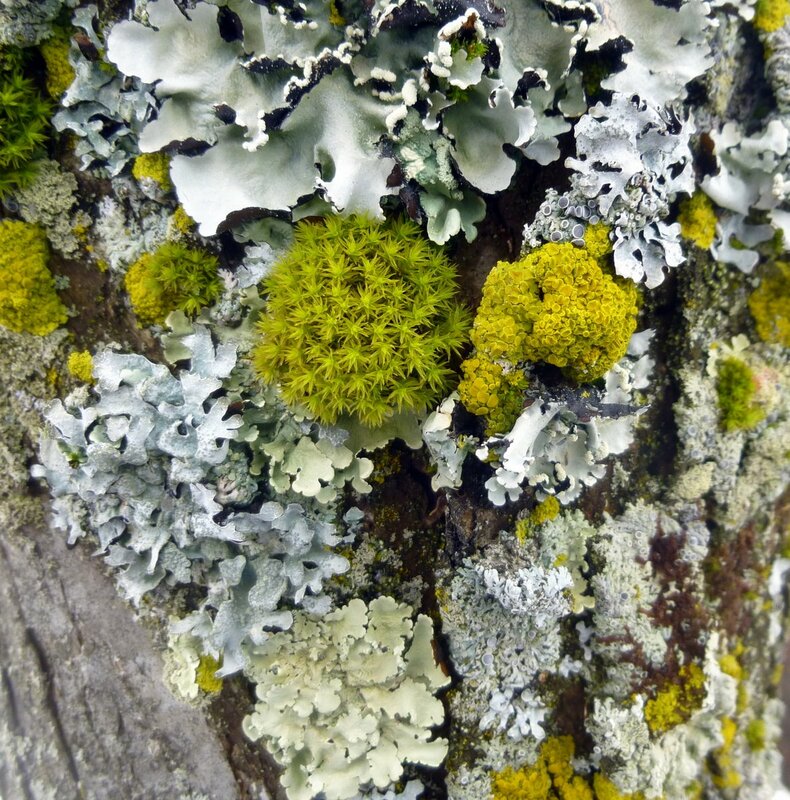 At this point I should say that, though many people think that lichens, mosses, and algae growing on a tree will harm the tree, that isn’t true. These growths are epiphytes and take nothing at all from the tree. They are simply looking for a convenient place to perch, much like a bird, and get everything they need from the sun, rain and air. However they do like high humidity and still air and their presence might be a sign that the tree should be in a drier place with better air circulation, but if a tree seems sick we shouldn’t automatically blame what’s growing on it. Instead we should call a certified arborist and find the true cause. Trees have natural channels in their bark that channel rain water down to their roots, and mosses and lichens often take advantage of that. Both lichens and mosses like lots of water and can usually be found growing along these tiny streams. This photo is a closer look at the moss in the center of the above photo. 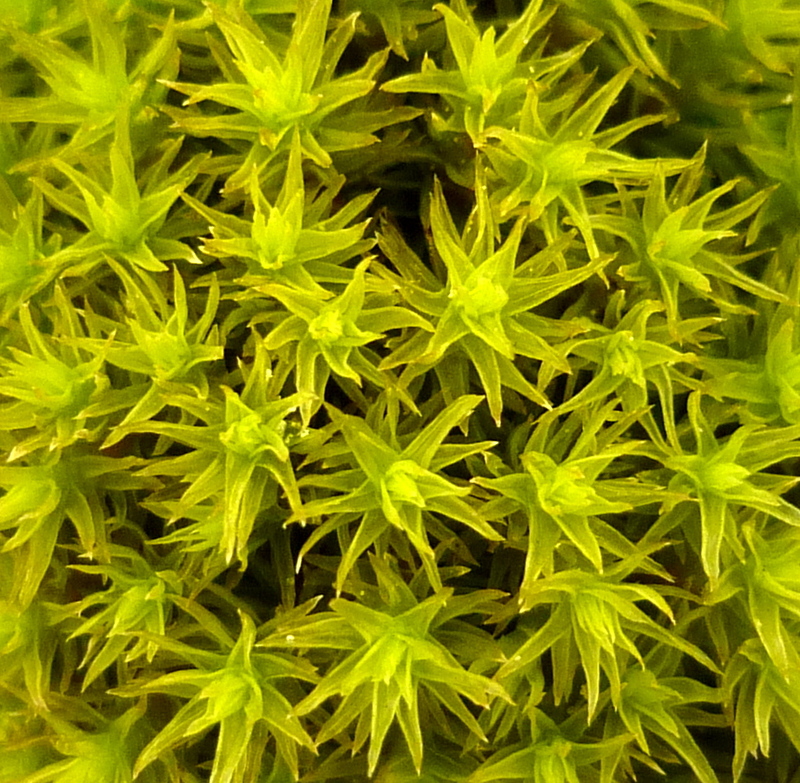 I’m fairly certain that it’s called Lyell´s bristle-moss (Orthotrichum lyellii.) In this photo it was good and wet. 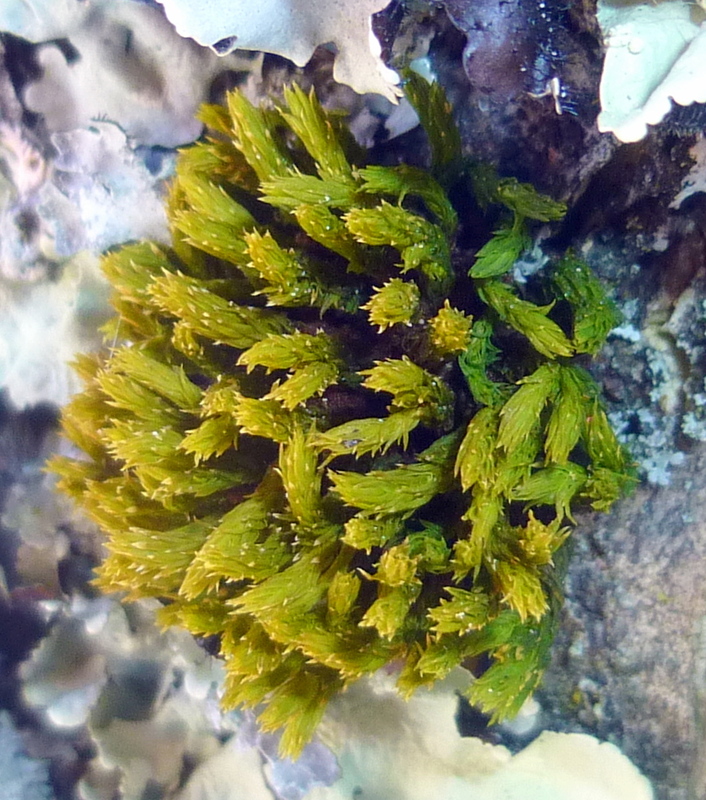 It’s hard to believe that this is the same moss that’s in the previous photo, but it is. The difference is this photo shows what it looks like when it dries out. I took these photos over a few days so I could show you the changes that these plants go through between their wet and dry states. 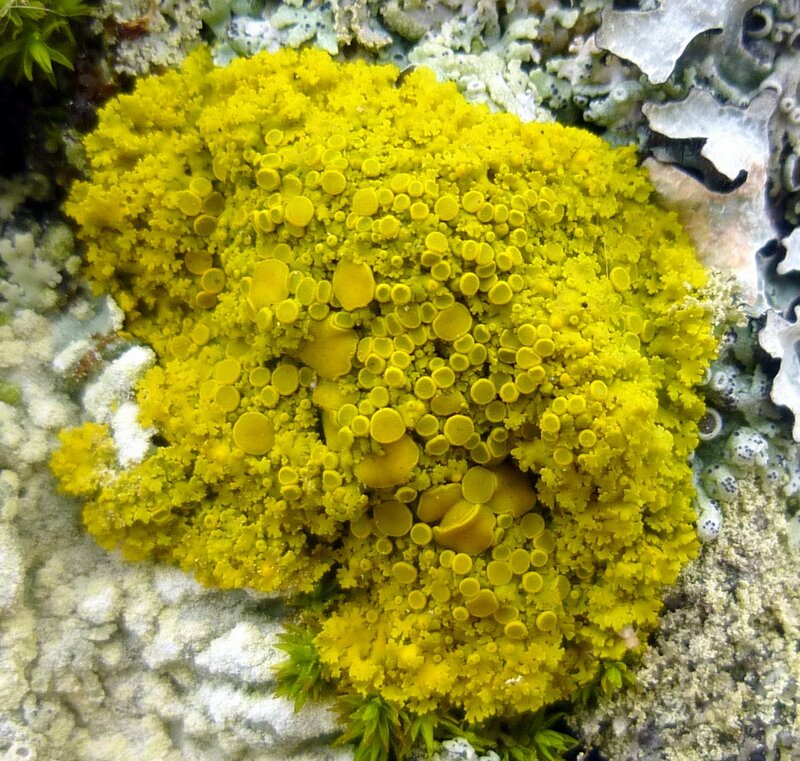 This is a good illustration of why serious moss and lichen hunters do so immediately after it rains. 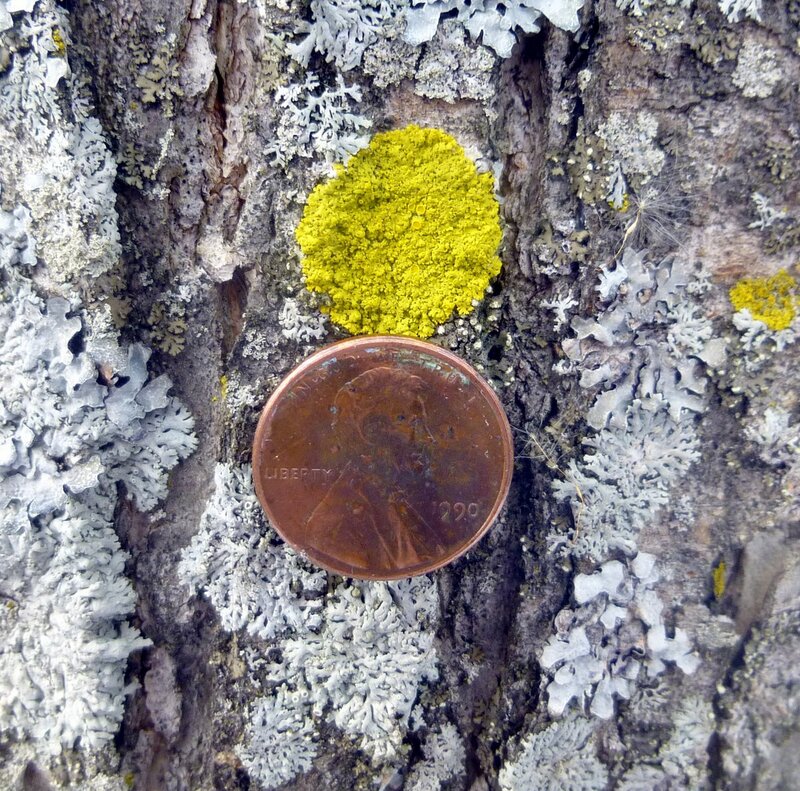 I finally figured out how to make a penny defy gravity so we could get an even better idea of the scale of some of these lichens. For those of you not familiar with the size of a penny, they are 3/4 of an inch (19.05mm) in diameter. 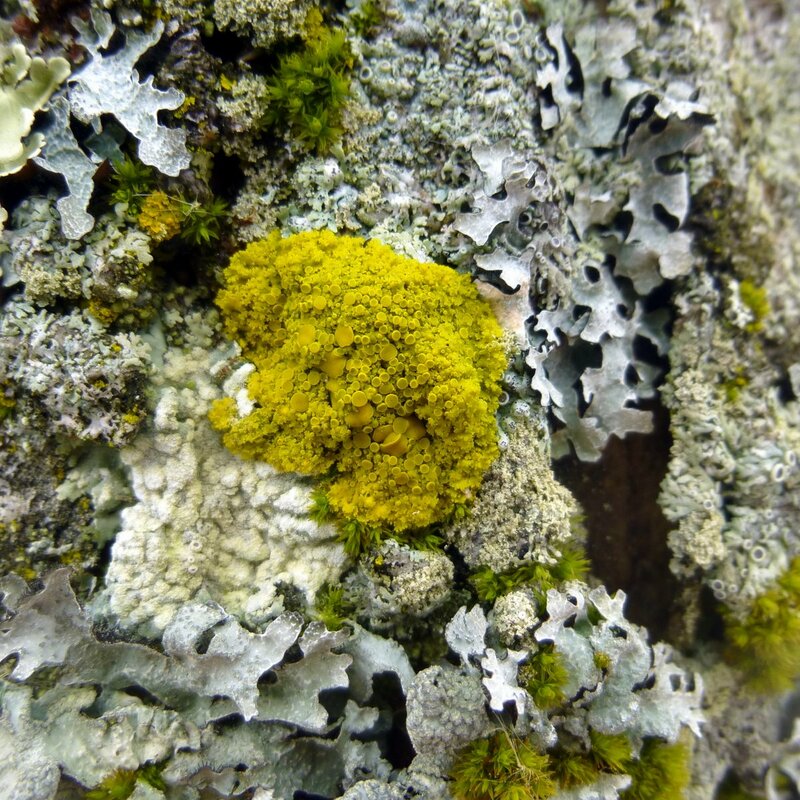 Unfortunately, though I can show you this lichen’s size I can’t tell you its name. 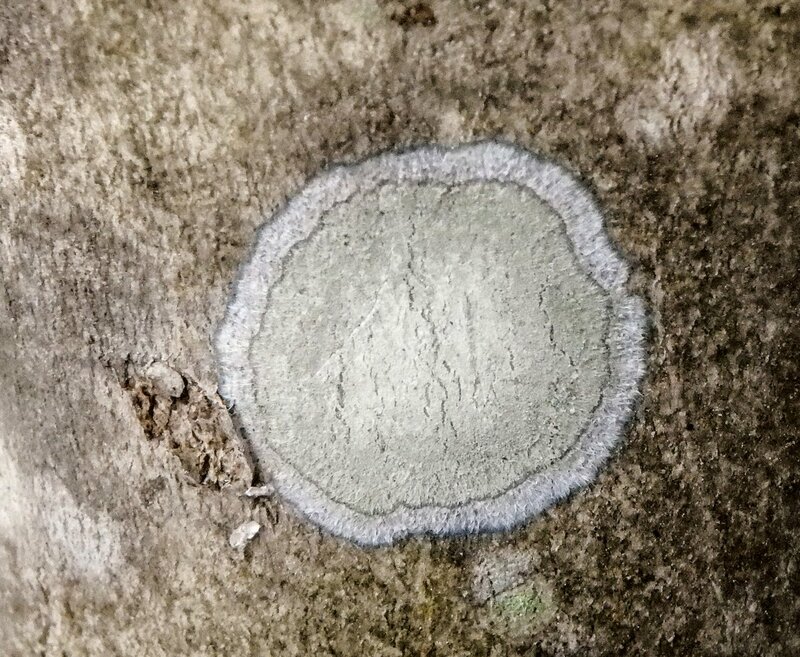 There are a few poplar sunburst lichens in this area but I’ve never seen one as flat or as round as this one, so I’m not sure if that is what it is. Whatever it is it was producing spores, as its tiny round fruiting bodies (apothecia) show. They’re the parts that look like tiny suction cups. 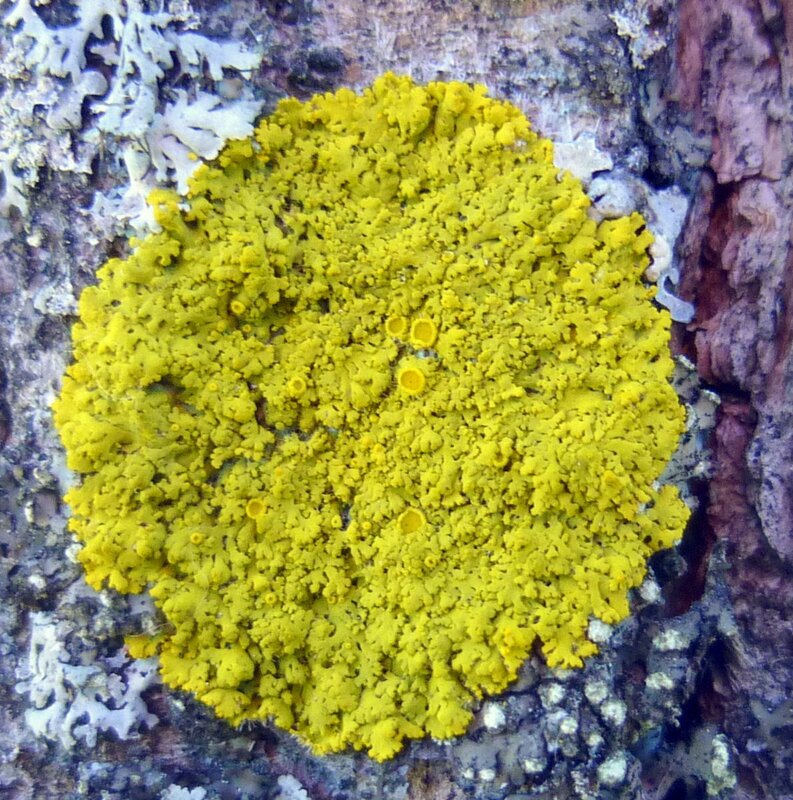 For now I think I’ll just call it a yellow shield lichen. I know where it lives so I’ll watch it over time to see how it changes. 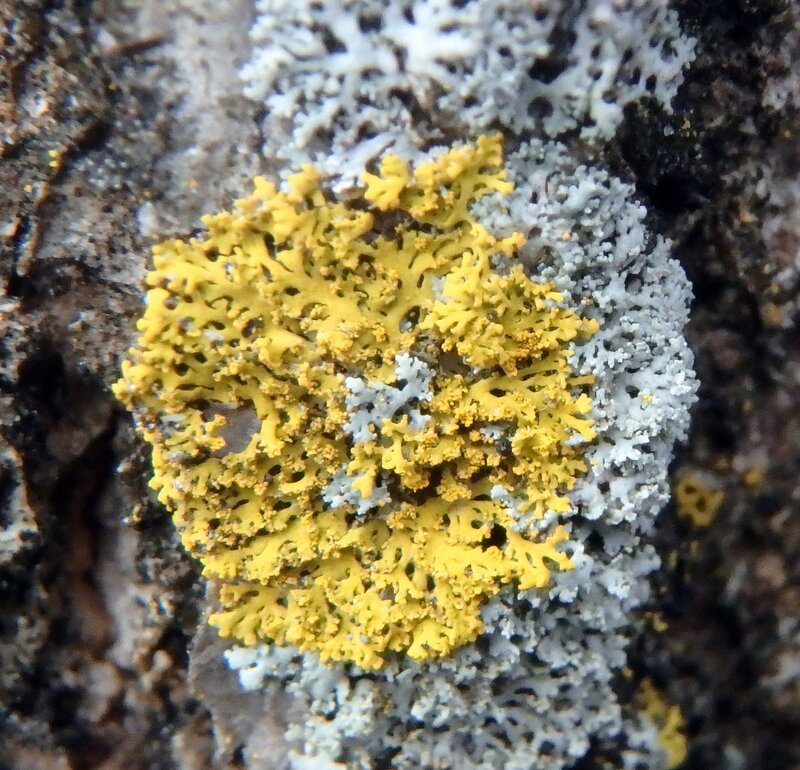 I have no doubt that this lichen is a poplar sunburst lichen (Xanthoria hasseana.) Its growth habit is much different than the flat, round example seen previously. 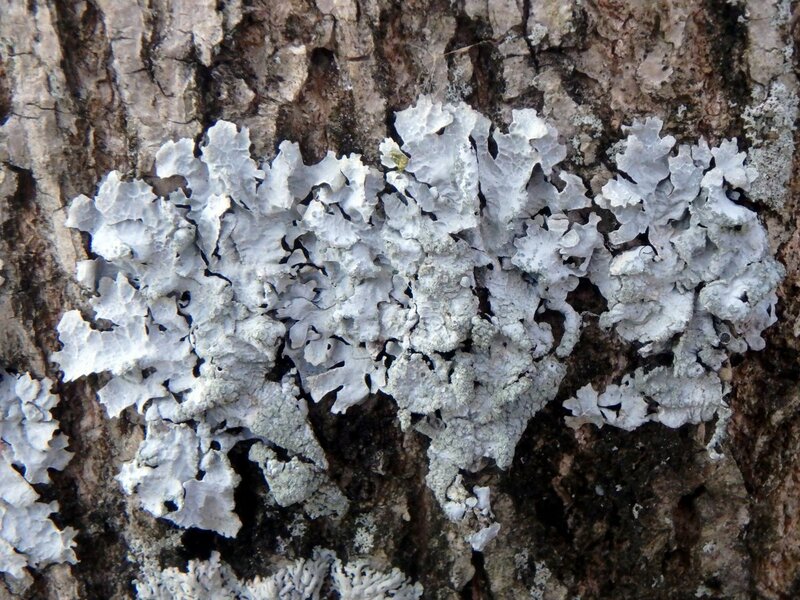 Virtually every photo I’ve seen of this lichen shows the mounded, irregular shape seen here. Poplar sunburst is a beautiful lichen and one of my favorites. It seems to never stop producing spores as the many fruiting bodies (apothecia) in this photo shows. You would think that such a prolific lichen would show up just about everywhere, but this is the only place I’ve ever seen it. That makes me wonder about the viability of its spores and how far they really travel on the wind. 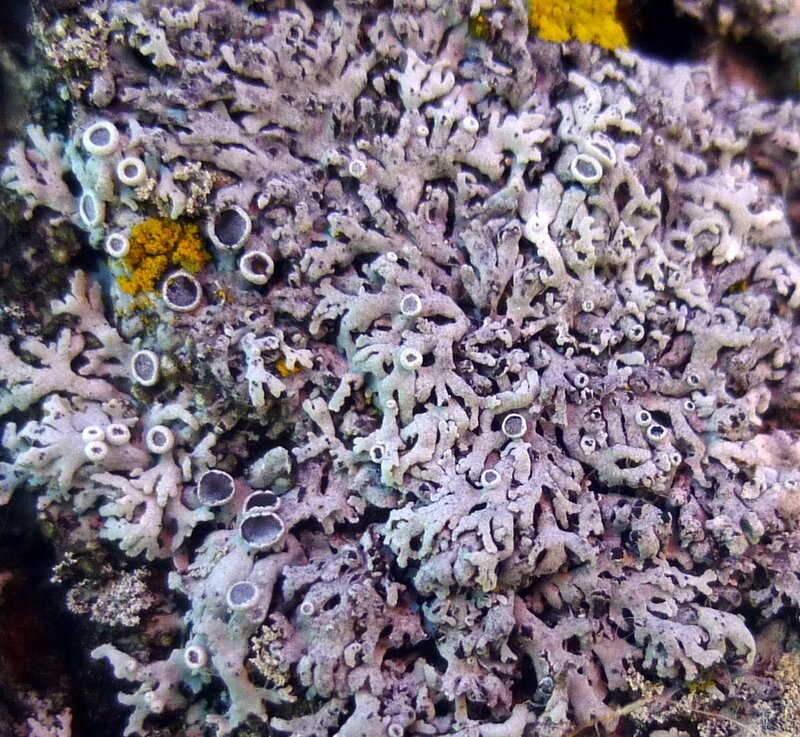 This lichen almost had me fooled into thinking that it was a black eyed rosette lichen (Physcia phaea) but the photo clearly shows that its “eyes” (apothecia) are more bluish gray than black. 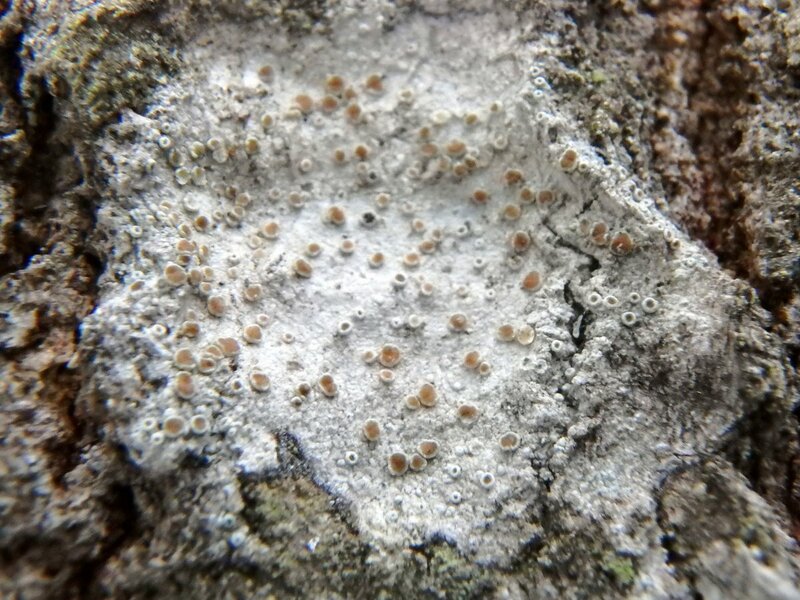 For that reason I believe that it’s a star rosette lichen (Physcia stellaris), which has dark brown apothecia that are often pruinose. Pruinose refers to a white, waxy, powdery coating like that found on blueberries, plums, and first year black raspberry canes. 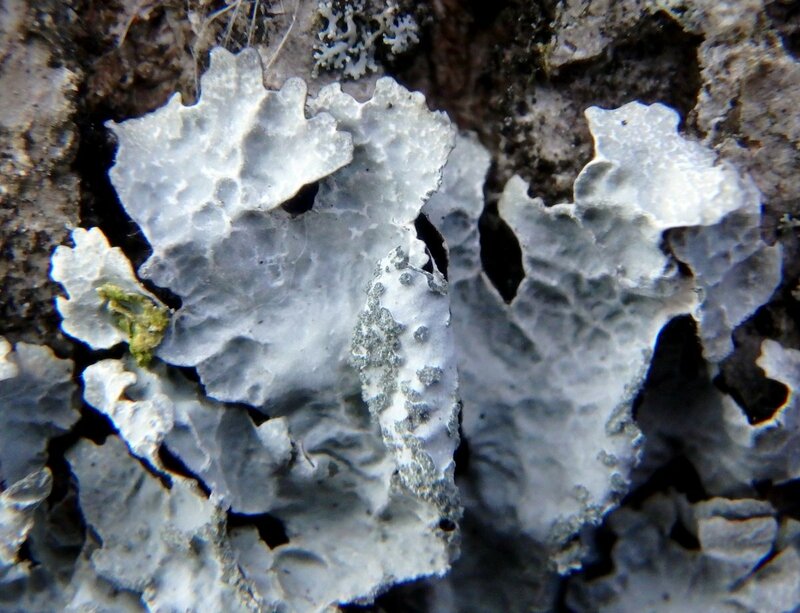 I’ve noticed by watching smoky eye boulder lichens, which also have pruinose apothecia, that the coating can reflect light in different ways, sometimes appearing gray and at other times more blue. 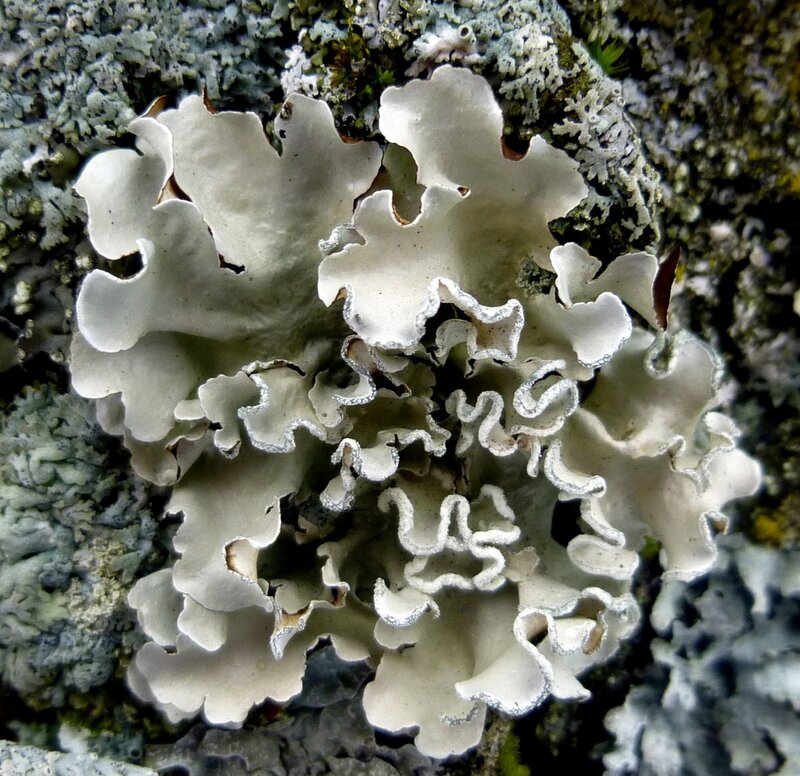 The uniform pale gray color, broad rounded lobes with erect edges, and soralia on the lobe edges all point towards this being a powder edged ruffle lichen (Parmotrema stuppeum). 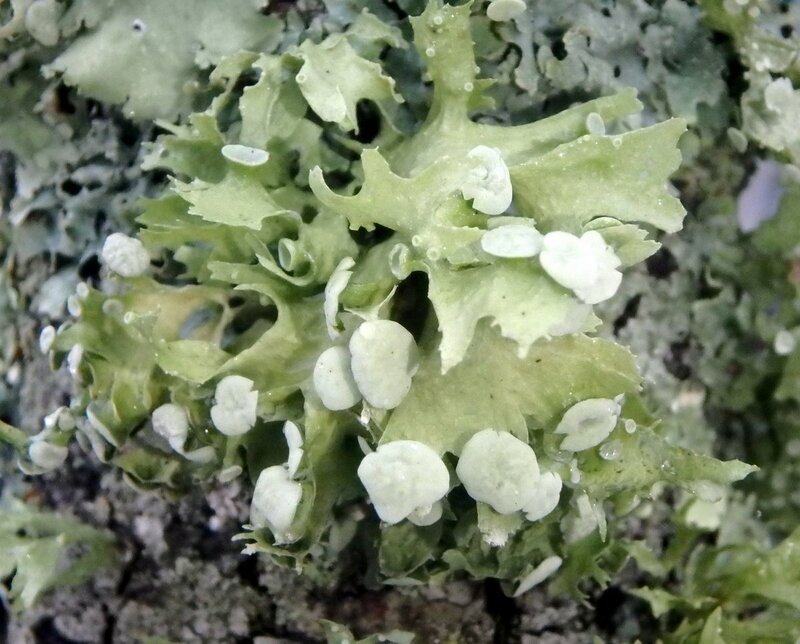 In this example the soralia are white and granular and make the lichen look like its edges have been dipped in sugar. 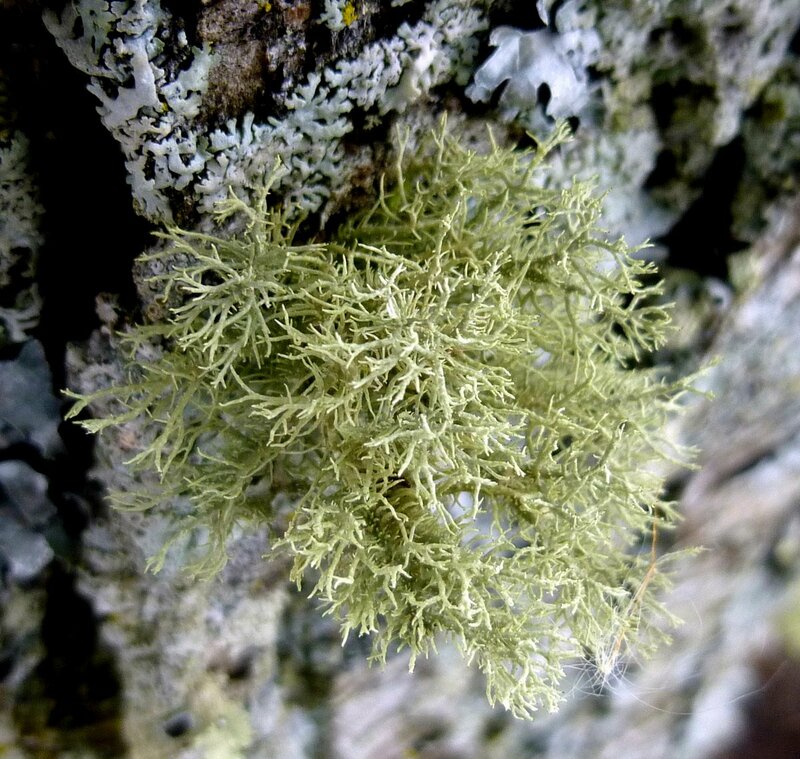 Soralia are meant to fall or break off a lichen and are used as a vegetative means of propagation. 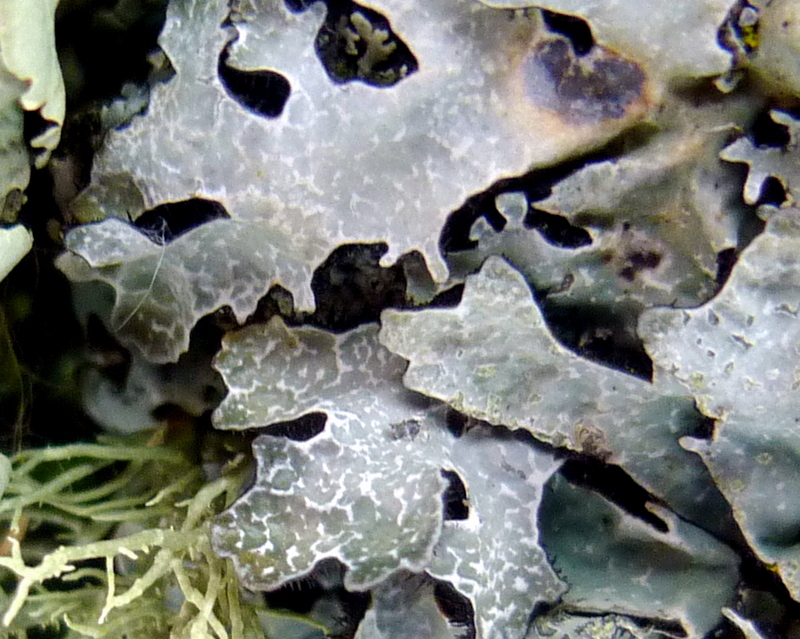 Another feature used to identify this lichen is its black to brown undersides, which aren’t visible in this photo. 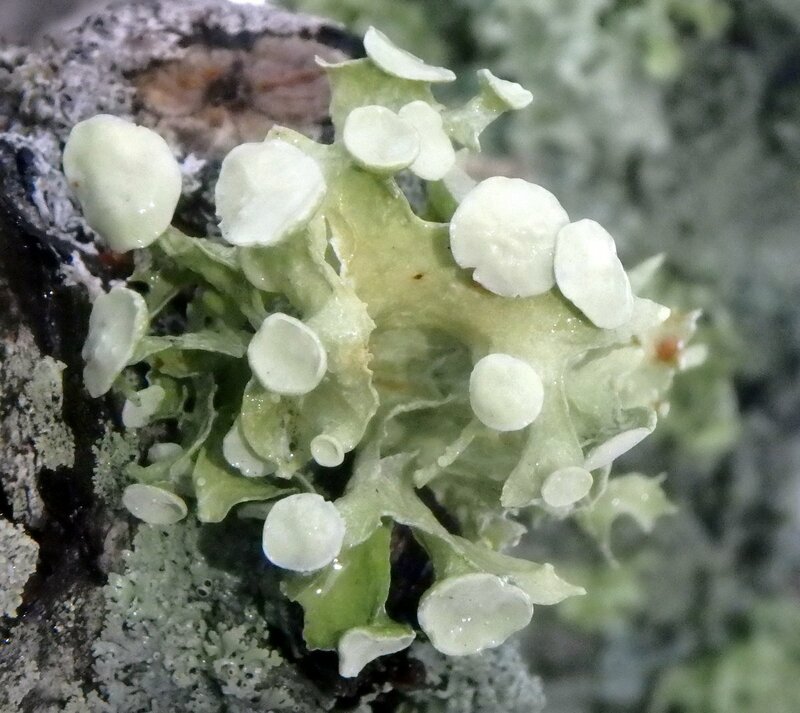 Here is another example of soralia (aka soredia) on the lobe edges of a lichen but these are much larger and more noticeable than those in the previous photo, and it’s easier to imagine them breaking off when a chipmunk runs over them. 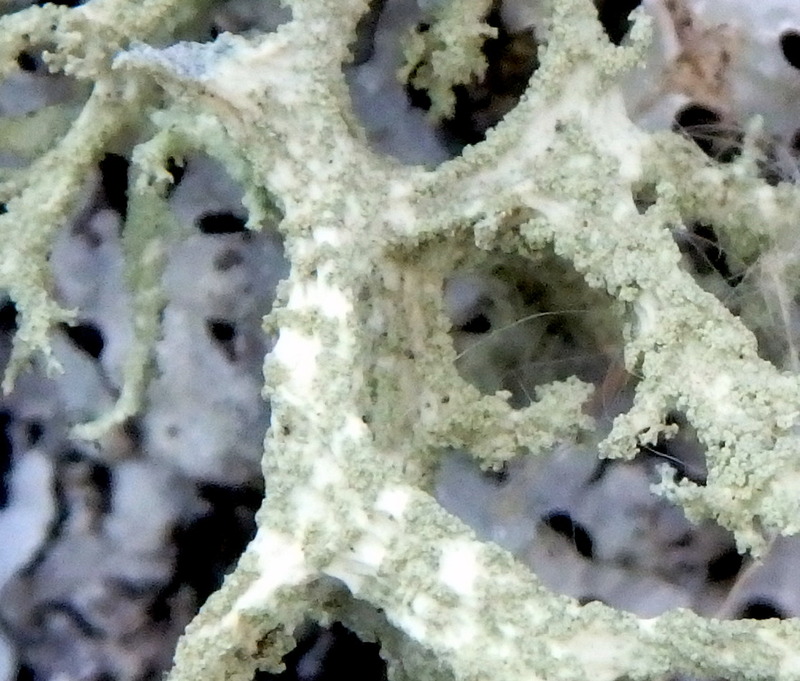 I’m fairly certain that this is a netted rimelia lichen (Rimelia reticulata) because of its soralia, but also its black undersides and root like rhizines, which are hard to see in this photo but are there. 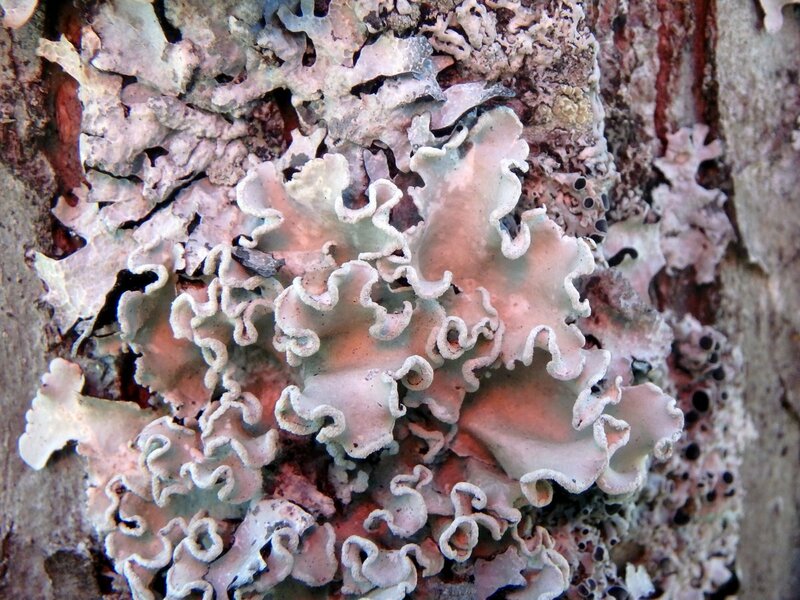 This is the first time I’ve ever seen this lichen and the previous powder edged ruffle lichen, so I’ve learned a lot from that tree. 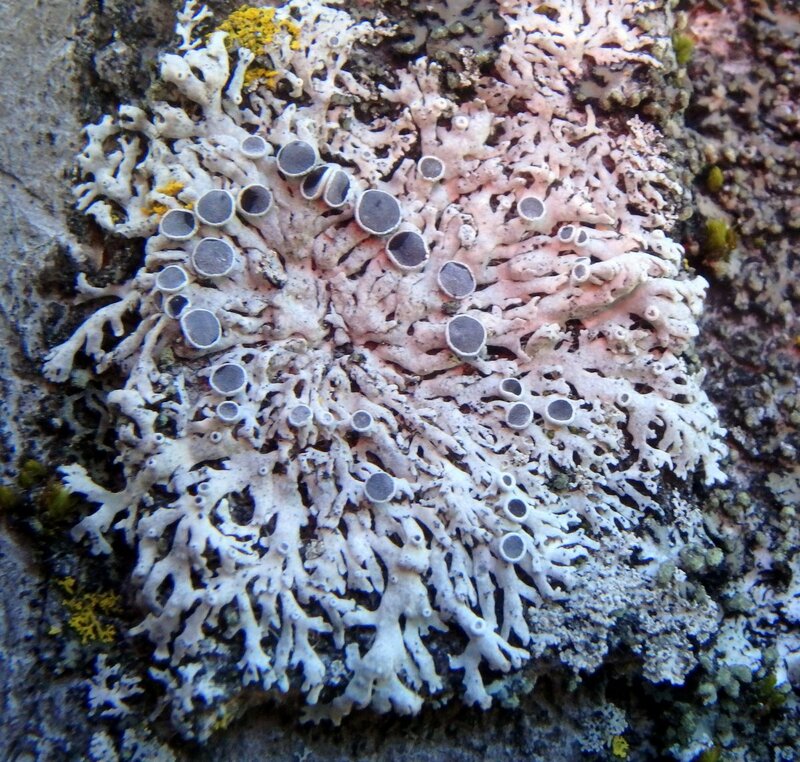 This lichen I have seen before but only once or twice. 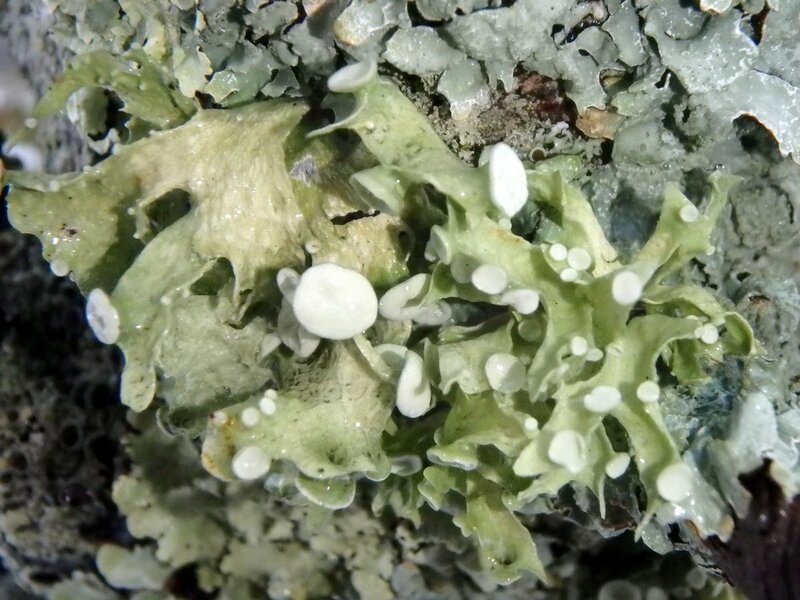 Because it looks like its lobes were hammered out of a sheet of steel it has the not so surprising name of hammered shield lichen (Parmelia sulcata). 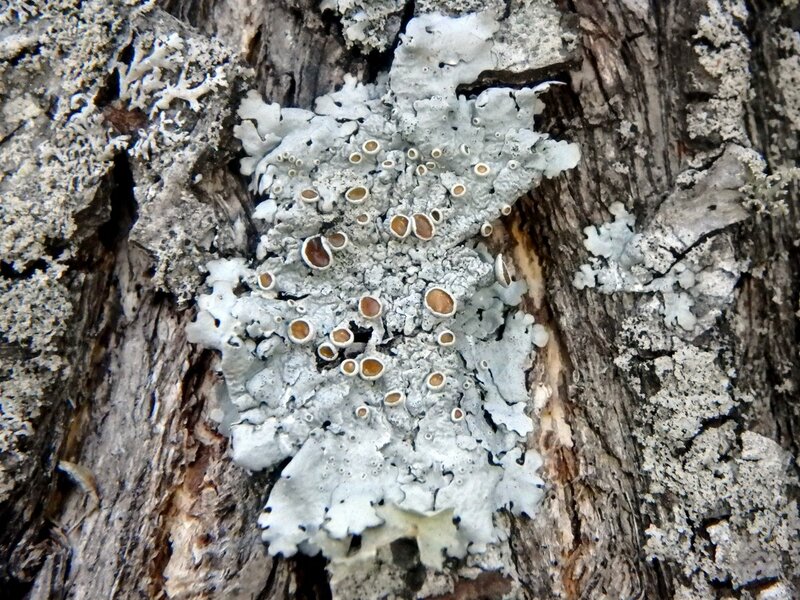 I’m glad that I found so many different gray lichens. At a glance it’s easy to think ho hum, another gray shield lichen, but I hope this post might convince people that it really is worth taking a moment to get a closer look. 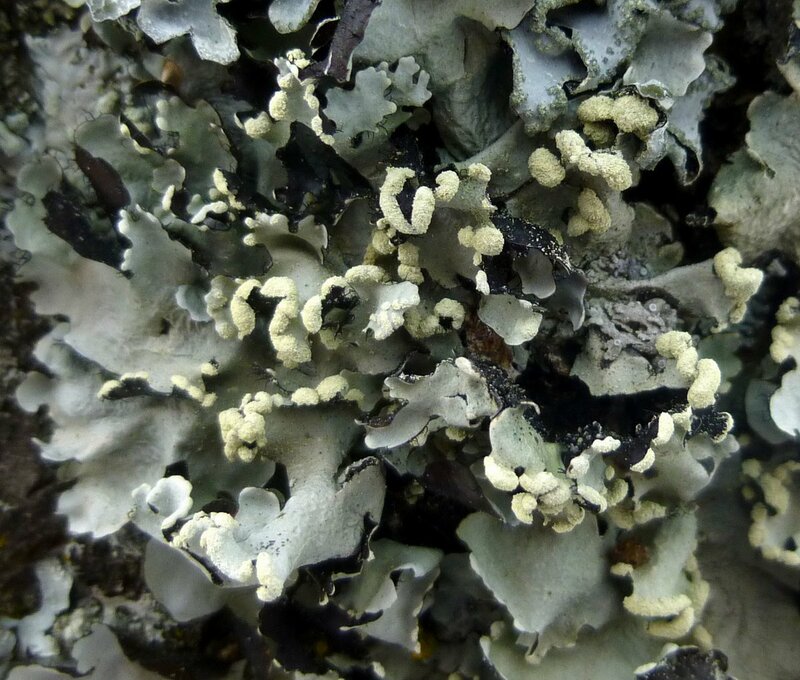 Even gray lichens can be surprisingly beautiful. Here is something that has had jerry and I scratching our heads and wondering about for over a month now. 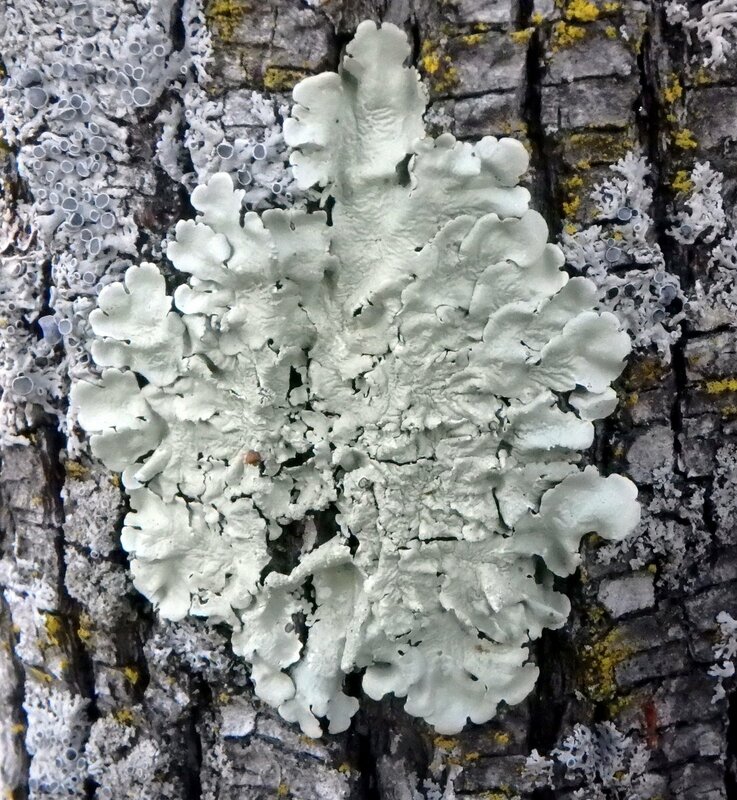 Jerry first noticed that his lichen photos showed some kind of white, thread like filaments on them and when I went back and looked at my photos I saw that some of the lichens showed the same thing. 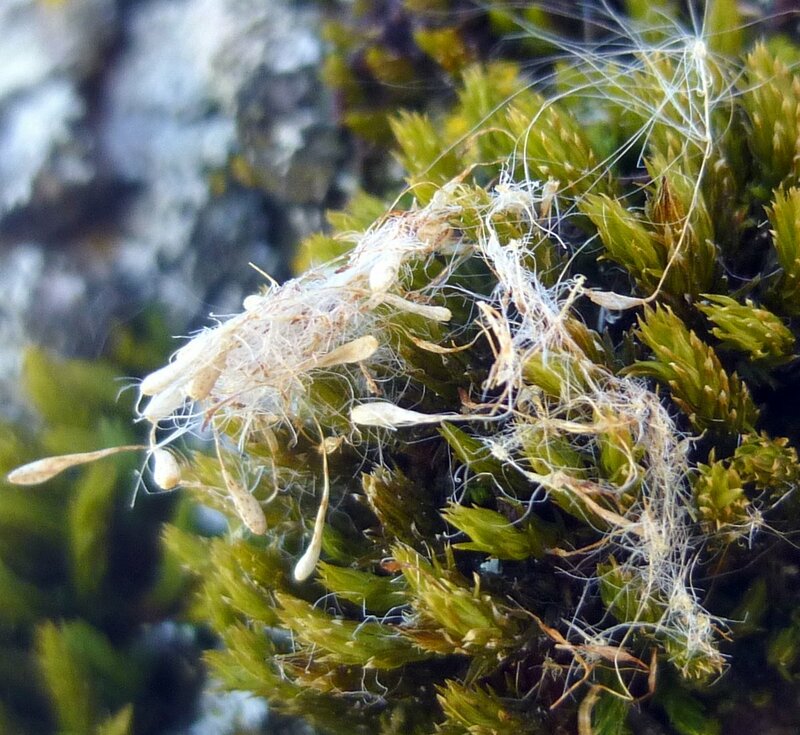 The fact that they were on moss in this instance almost fooled me, because the club shaped objects in the photo look much like the spore capsules on a moss called puckered tuft moss (Ulota coarctata) and for a short time I thought I had solved the puzzle. This photo shows a single tiny club shaped object from the mass in the previous photo. It is so small that I can’t even think of anything to compare it to. Human hair might be best, but the club like end has a greater diameter. It can’t be a moss spore capsule because if it were there would be an opening in the end nearest us for the spores to escape through. Since there is no opening it must be something else. 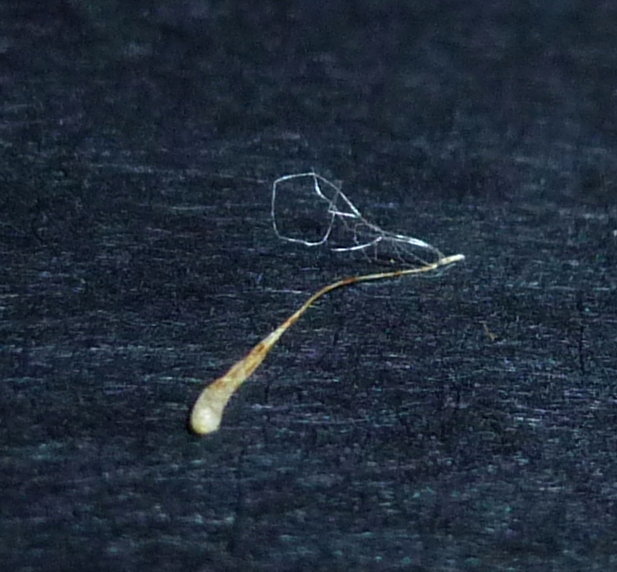 I think that the shiny, hair-like filaments at the far end show that it is a seed of some kind, and those shiny filaments are the seed’s crushed “parachute.” It’s very similar to a dandelion seed but I don’t know if that’s exactly it. There are many other plants with cottony seeds in the area including willows, asters, cattails, milkweed, yellow goat’s beard and others, but none of them are an exact match. If you are reading this and know what plant it came from I’d be very grateful if you filled me in. I’m sure that Jerry would thank you too. 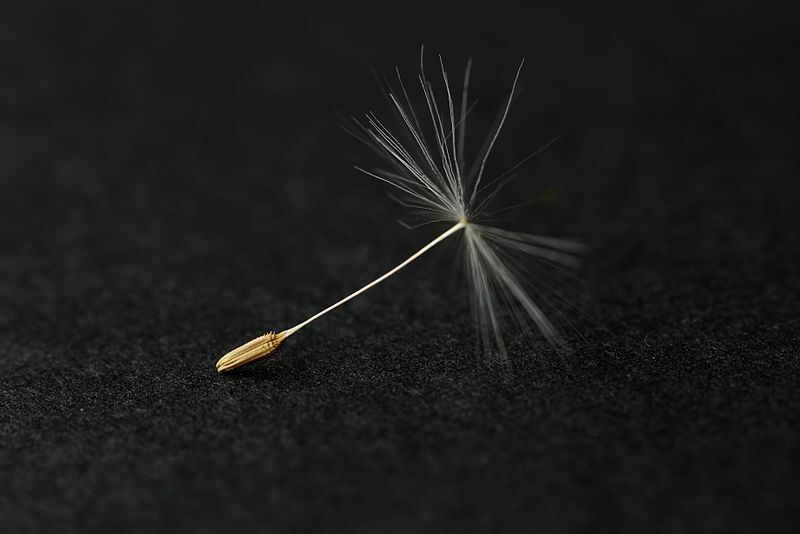 This excellent photo by Wolfgang Arnold on Wikipedia Commons shows the “parachute” part of a dandelion seed looking like we would expect it to, but what would it look like after being stuck to a tree all winter? And what happens when the brown seed falls off or degrades? Does it leave a white, club shaped end like we see in the previous photo? As often happens nature brings more questions than answers, but we can learn a lot by solving the riddles that are presented to us. I’m anxious to see dandelions bloom again. 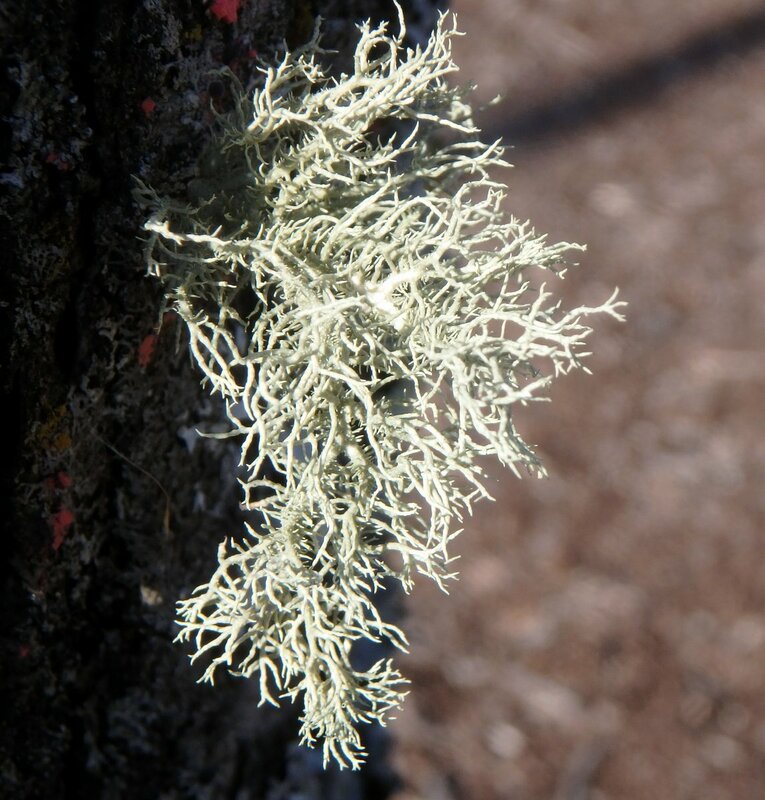 There were some very healthy looking examples of bristly beard lichens (Usnea hirta) on this tree, and If you look closely at the lower right side of this one you’ll see how the white filaments catch on lichens and show up so clearly in photos. 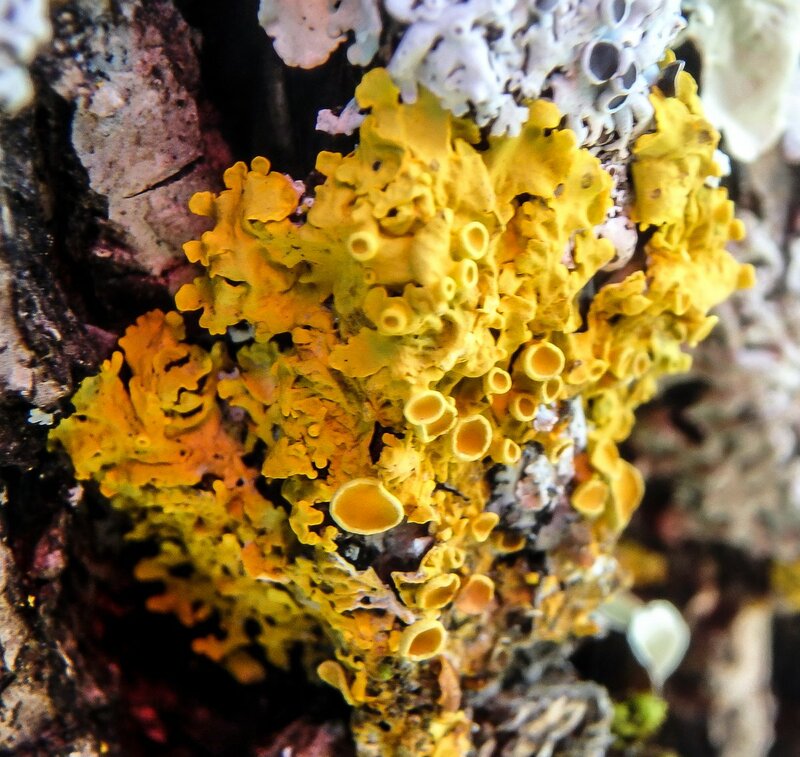 I’m sorry that this post turned out to be so long but that’s what happens sometimes when you stop to look at a tree-whole new worlds open up unexpectedly and you see things that you’ve never seen before. I hope you’ll find that out for yourself one day soon.